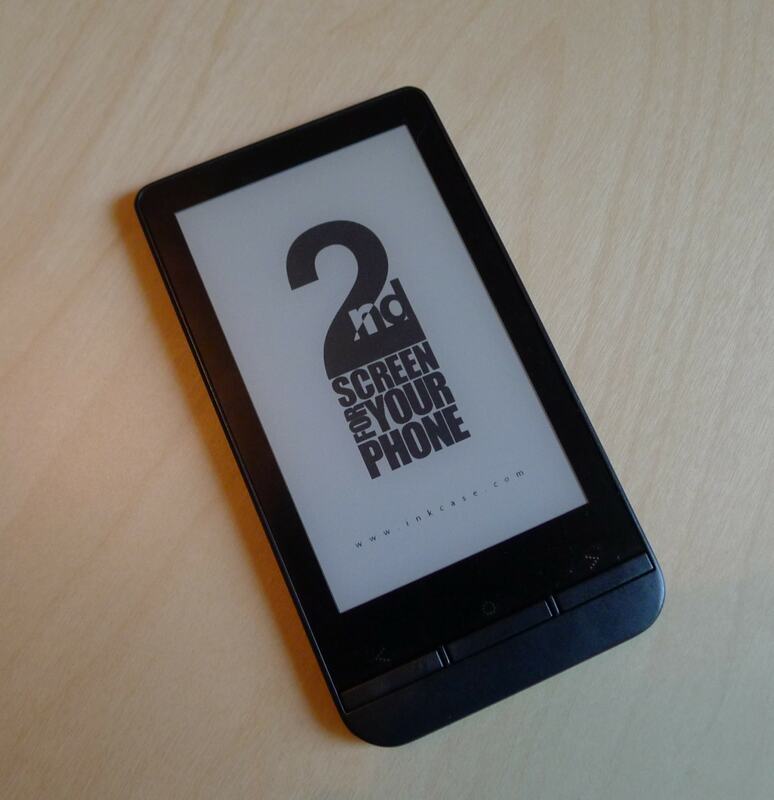 Thrilled at the possibility that the InkCase Plus might add a secondary E-ink screen to your smartphone? You should be. My InkCase Plus early review sample arrived a mere 2 weeks after the Kickstarter campaign began, and I can see how the design has been improved over the models released last year. Initially launched last June, InkCase is a line of smartphone cases from the Singapore-based consumer electronics design house Gajah (aka Oaxis, their in-house brand name). The first two models focused on custom cases for the iPhone and Samsung smartphones, but they didn't have much success or get much press attention. in fact, I know of only three reviews: mine, Gear Diary, and TUAW, none of which were complimentary. 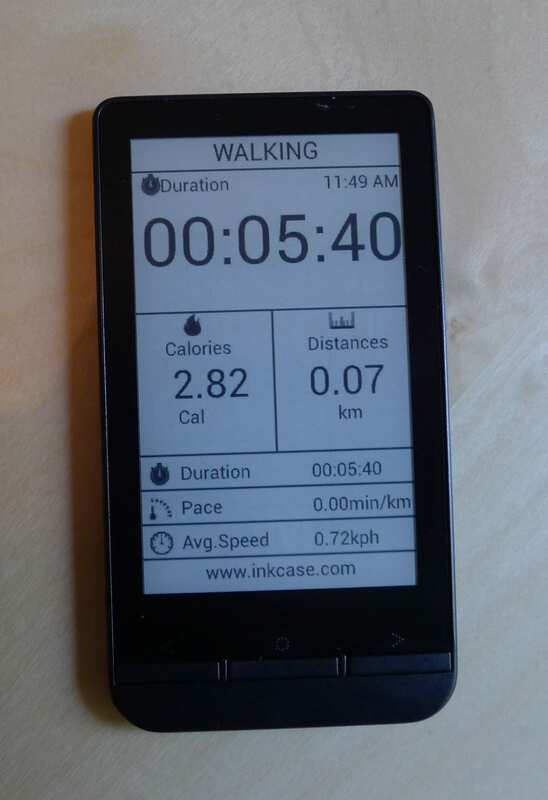 I was disappointed in the case I reviewed last August; it was slow, had a poor quality 4.3" epaper screen, and came up short in both the software and usability depts. Apparently Gajah wasn't too pleased with that design either, because they went back to the drawing board and came up with the design for the InkCase Plus. First revealed at CES 2014, the InkCase Plus was formally launched in February 2014. And then a couple weeks ago Gajah launched a Kickstarter campaign to fund production. It's a good idea, and it certainly has the hardware to back it up. My review unit sports a 3.5" Pearl E-ink screen which is impact resistant, fast, and reasonable sharp (360 x 600 screen resolution). There are 3 buttons on the front, and inside the case I found a cellphone battery of unknown capacity, Bluetooth, a USB port (for power only), and a SpreadTrum SC6531 chip. I didn't see the speaker or microphone which were mentioned in the Kickstarter campaign, but this is an early review sample so I am not concerned. Correction: The Plus wasn't supposed to have a speaker. This detail came from the less than clear description of the Kickstarter page. All in all, this is a great hardware design. It's small, light, and fast. I've spent some time reading on the InkCase Plus, and it turns the page as fast as a leading reader like the Kindle Paperwhite. If I were to judge this strictly on the hardware I would tell you to go get one right now. But while the hardware has been significantly improved over the prototype I saw at CES in January, I can't yet make the same claim about the software. One of my chief complaints about the InkCase last year was the lack of software support, and happily the new model (mostly) doesn't have that problem. Last year's model was dependent on three apps: a Companion app (required to pair the Plus with your smartphone), a photo app, and an ebook app. In the year since then Gajah has released a Sports app and they've updated the Companion app so it can control your music and send notifications from your smartphone to your Plus. That last feature requires Android 4.3 and above, so it won't be available to the majority of Android users. In fact, I can't test it due to my newest tablet running only Android 4.2 (my Sero 8 is on loan ATM) but I can tell you that the app listing in Google Play mentions the feature. In addition to the Companion app, I tested the Sports app and one of the ebook apps (but not the photo app). Getting the apps to pair with the Plus was difficult at first, but once over that initial hurdle the Plus worked fine. Even when my tablet was asleep, the Plus stayed paired with it and kept working. In addition to the two apps which I tested successfully, I have also found a mention of apps called InkCase Now and InkCase Coupon. Those apps have not been released yet, so I can't tell you what they do. I plan to keep an eye out. This is one of two reading apps which Gajah has developed for the InkCase. It's a rather ugly app which is limited in features, but it does support a wide variety of formats (including PDF, Mobi, Epub, and even DRMed Epub) and it will let you read on the Plus. EpiReader sends the screen contents to the Plus one page at a time, and not the book, so you'll need to have your smartphone or tablet within range while reading. You will also need to use the app to do things like adjust the font size; the Plus is a passive display. As I mentioned above, the app was fast at turning the page. The screen was also quite sharp; the text was legible at a far smaller size than I was comfortable with reading. In fact, the second photo shows a page from a PDF which is surprisingly readable on a 3.5" screen. All in all, this device is great. I can't test all of the features because I don't have a finished unit or the necessary smartphone, but from what I have seen so far the InkCase Plus really does live up to the hype. Speaking as someone who put up his own money on Kickstarter to buy an InkCase Plus, I can't wait for them to ship. At the time I wrote this post, the Kickstarter has raised almost twice the goal of $100,000. Production is expected to start in September, with shipments going out in October. Gajah plans to develop cases for the iPhone, a couple HTC One models (M7, M8), the Nexus 5, and a couple models from Samsung. They've been running a poll since shortly after reaching their funding goal and those smartphones have each gotten 500 votes. I would rather see a standalone ebook reader in that form factor. Me too. It’s small enough that it could be slipped into a wallet. I agree about the desire for a standalone version but confess I still wanted this device enough to support the Kickstarter. I pretty much always have my phone within bluetooth range but it would be nice not to have to fiddle with an extra app on your phone just to use the reader. Thanks for posting this preview, Nate. I’m glad to hear the initial hardware passes muster. Now the countdown begins to see if they ship in October. I would be terribly surprised if they don’t ship. Gajah has a proven history of licensing their product designs to other companies and this is a finished product. So this is still the basis of operation? A pity. Might be ok for other apps and uses but not for an ereader app. There is API available for creating programs for the device, so perhaps somebody could make software would make a [very limited] stand-alone e-book viewer, that could be used to view a couple of books that you load on it in advance. That’s what I have been telling them. Nate, is is my understanding that the device doesn’t have front-lit e-ink. Is that right?